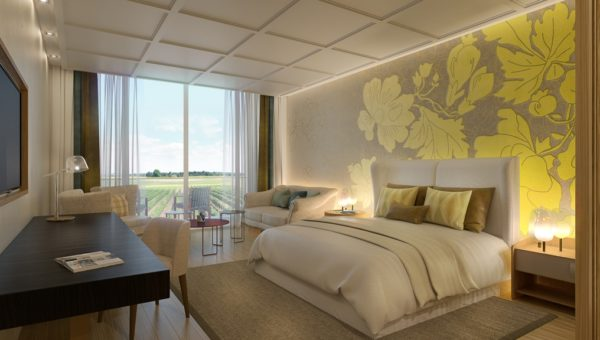 Champagne’s first contemporary luxury hotel, The Royal Champagne Hotel & Spa officially opened this week. Embracing the lush bounty of the champagne houses and the surrounding UNESCO World Heritage sites, guests will have exclusive access to private Champagne houses, harvesting sessions with local wine producers and tastings personally curated by the in-house concierge team. The Royal Champagne Hotel & Spa boasts an enviable location right in the middle of the vineyards that stripe the hills of Epernay, the capital of Champagne, and the historic villages of Champillon and Hautvillers of Dom Perignon fame. Reimagining a wine-country retreat for all seasons, local Reims-based architect Giovanni Pace has designed the property in the style of a contemporary amphitheatre, incorporating the original 19th Century Post House where it is said that King Charles X of France stopped over before heading to Reims for his coronation. ‘Champagne’ rooms start at £489.92 per night feature a king-size bed and private terrace. The top tier ‘Josephine’ suite meanwhile, will set you back £1,068.71 a night and boasts a sitting room and balcony overlooking vineyards. Each of the 49 rooms in the 16,000 square foot space features Hermès bath products. The original property has been closed since 2014 after it was acquired by Boston-based Champagne Hospitality collection, a group of boutique luxury hotels and spas that includes the award-winning Le Barthelemy Hotel & Spa in St. Barths. The hotel is led by Nicolas Béliard, formerly General Manager of the Peninsula Paris. Royal Champagne Hotel & Spa is home to the region’s first world-class destination spa spanning 16,000 ft. In partnership with acclaimed French brand Biologique Recherche, the wellness centre comprises nine treatment rooms; state of the art fitness facilities; a wood-lined yoga studio; eucalyptus-infused sauna; manicure and pedicure stations, and a mosaic-tiled Hammam. Completing the experience are two temperature-controlled, chaise longue-lined swimming pools – one indoor, one outdoor – along with dedicated staff who deliver invigorating juice blends and guide guests to multiple relaxation lounges. Biologique Recherche offers a highly personalised approach, with signature treatments including the ‘Soin seconde peau / Second skin treatment’, a regenerating and lifting facial treatment. All products are formulated using pure natural or biotechnological compounds and are fragrance free. Spa packages and retreats will also be available throughout the year. Two-star Michelin chef Jean-Denis Rieubland is the Royal Champagne Hotel & Spa’s Executive Chef, where he leads the two gastronomic dining experiences – a gourmet dining room, Le Royal, and a more casual, all-day restaurant, Bellevue. Formerly Executive Chef of Le Chantecler at the Negresco Hotel in Nice, Chef Rieubland brings the highest level of gastronomy to Royal Champagne, where he will preserve French ‘know-how’ while injecting a contemporary touch. Rieubland’s cuisine is influenced by the local surroundings, working closely with farm producers of the region. He will also be developing a Chef’s garden on a large terrace overlooking the hills of Épernay. The Comité Champagne have announced the yield for the Champagne harvest is 10,800 kg per hectare including 500kg per hectare to be unblocked from the reserves. 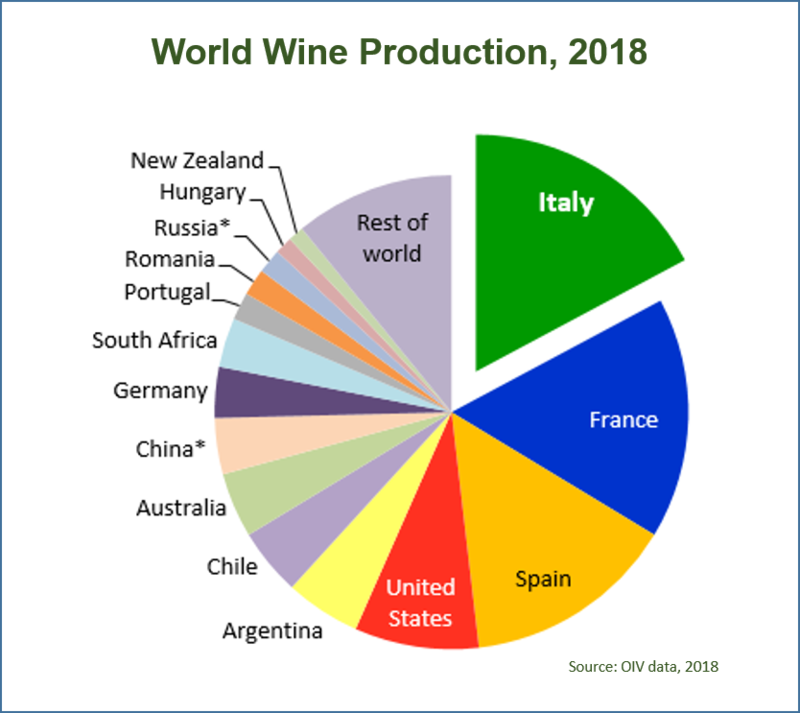 The Minister of Agriculture recently announced that the French wine harvest would be ‘historically low’. Yields in some wine making areas such as Bordeaux and the Jura have been cut as much as 50%. What has caused this is the lack of rain in Spring and severe frost in April. In Champagne, the frost damage stands at 20%. Weather has been good since mid-May and the vines are about ten days ahead in their growing cycle. The harvest is expected to start in late August. This will make it one of the five earliest in the history of Champagne. The Champagne region has announced the start dates for the 2016 harvest. Commencing today (September 12) through to September 26h there will be over 120,000 pickers, porters, loaders and press operators descend on the vineyards of Champagne for the harvest – the moment every winegrower has been waiting for. Each harvest is different in terms of grape ripeness, potential alcohol levels and natural acidity – so picking the right moment to harvest is essential. A ripening observation network for the accurate timing of harvests. Twice a week, just as the grapes start to change colour (véraison), samples are taken from some 450 control plots spread throughout the Champagne area. The selected clusters are then checked for rate of colour change; average weight; estimated sugar and total acidity content; also for any incidence of grey rot. The results are transmitted the same day via internet, so allowing the Comité Champagne to establish reference values for each parcel of vines, together with mean average values (potential alcohol levels and natural acidity) for each department and grape variety. A data summary is then notified to the technical officers concerned, starting with the regional heads of the AVC (Association Viticole Champenoise). This enables them to attend the pre-harvest meeting with a very clear idea of when picking should start in their respective communes. It is the pulp that contains the organoleptic compounds and elements required for effervescence (sugar, acidity, etc); and only pulp alone can deliver the desired clear, pale juice, bearing in mind that 3/4 of Champagne wines are made from black grapes. Pulp extraction is specifically designed to avoid colouring or staining the musts when pressing black-skinned grapes. Hence the need for manual picking, selecting whole, undamaged clusters that must remain that way right up to the point of pressing itself. The clusters are transported to the press house in purpose-made bins with drainage holes that allow any juice to escape, so preventing the berries from macerating in their own juice. 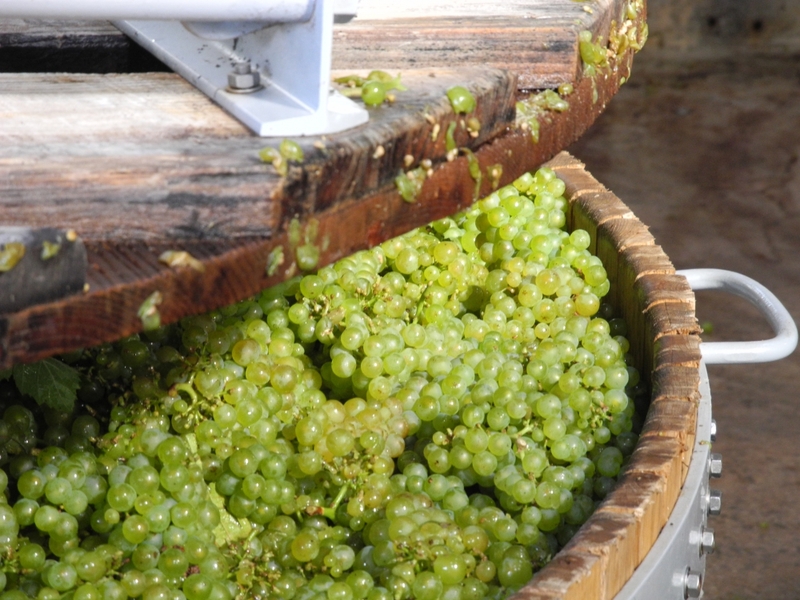 Manual picking remains the tradition in Champagne – the requirement for whole, undamaged grapes is the same today as it was in the 18th Century. Pickers have roughly a three-week window in which to work – beyond that point the grapes will be past their best. Just to complicate matters, all Champagne grapes reach their peak of ripeness at about the same time. 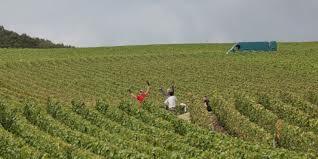 Some 120,000 pickers work in teams (‘hordons’ in French) of four per hectare, of which nearly 100,000 are given bed and board by the Winegrowers and Champagne Houses. The harvest base yield fixed by the INAO is 10,400 kg/ha, revisable upwards or downwards depending on the quality and quantity of the yield but capped at 15,500 kg/ha for AOC production. The rationale for capping yields lies in the high-density planting system in Champagne, with vines planted very close together (8,000 per hectare) to improve ripening and therefore quality. Limited juice extraction – just 102 litres of must per 160 kg of grapes – is a key part of this policy and brings the final yield to 66 hectolitres per hectare.